M.C. Escher, whose complete name is Maurits Cornelis Escher was a Dutch artist who was born in Leeuwarden on 17 June 1898. His parents — George Arnold Escher, a civil engineer, and Sara Gleichman — had their son educated in the fields of carpentry and music. As a boy, Escher showed artistic talent but made poor marks in school. After primary and secondary school, he studied architecture for a short time before moving on to study decorative arts. During this part of his education, Escher learned to create woodcuts and made more progress with his drawing. In 1922, M.C. Escher spent time traveling through Spain and Italy. These travels were important to the artist. In addition to being inspired by the architecture and landscapes that he experiences during this time, he also met the woman who he was to marry. Jetta Umiker. The couple moved a number of times within Italy, Switzerland, and Belgium during the early years of their marriage. In 1941, they were forced to move once again due to World War II. This time, they moved to the Netherlands and remained there for nearly thirty years. Escher is best know for his woodcuts, lithographs, and mezzotints. His work often showcases architecturally impossible structures, tessellations, metamorphosis, and experiments with infinity. Some of his best-known works are Still Life With Spherical Mirror (1934), Hand with Reflecting Sphere (1935), Magic Mirror (1946), Drawing Hands (1948), and Relativity (1953). During the course of his career, he was awarded a Knighthood of the Order of Orange-Nassau. At the age of 73, M.C. 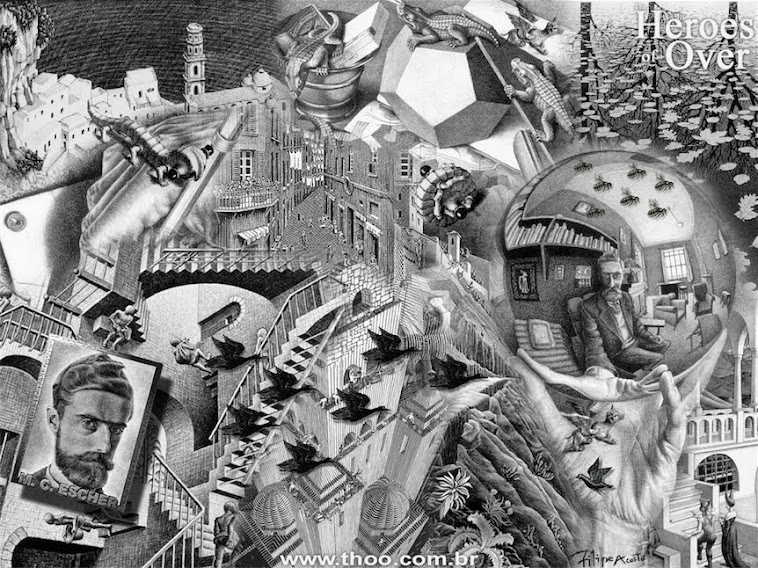 Escher passed away on 27 March 1972. During the course of his life, M.C. Escher developed quite a following. In fact, there continue to be many Escher fans throughout the world today. His works, which question human perception and inspire thoughts of alternative realities are reproduced and sold in the media of posters, coffee cups, ties, puzzles, and even sculptures. The Escher Museum, dedicated to the Dutch artist, was opened up in The Hague, Netherlands n 16 November 2002. However, there are many other museums that are home to M.C. Escher works. The National Gallery of Art in Washington, D.C. and The National Gallery of Canada in Ottawa are two public museums that own original Eschers. The work of M.C. Escher is also part of some of the most prestigious private collections in the world. Escher was born June 17, 1898, in the Netherlands. M.C. Escher was known for being a graphic artist. His art was mathematically inspired and consisted of woodcuts and lithographs. 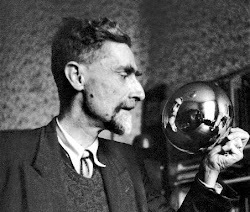 His full name is Maurits Cornelis Escher, and he was the youngest child of a civil engineer George Arnold Escher. From 1903 to 1918 he attended school. He had bad grades and had to repeat some classes twice. In 1919 Escher attend the Haarlem School of Architecture and Decorative Arts. When Escher left school he had experience in architecture, drawing and woodcuts. In 1921 Escher traveled throughout Italy. In 1924 he married Jetta Umiker. The couple moved to Rome and settled there until 1935, until politics and Mussolini became unbearable. For the next two years they lived in Switzerland. Escher was very fond of the Italian countryside and he was eager to go back to Italy, but they moved to Belgium instead. By January 1941, WWII forced them to relocate again; the couple then moved to Baarn, Netherlands, and that is where they lived until 1970. Escher created many interesting works of art. He used mathematics in his pieces of art although he was not well-trained in the subject. He used black and white to create dimension. He used cubes, cones, spheres and spirals. Escher’s art work was especially liked by mathematicians and scientists. His mathematical influence came from a trip he took in the Mediterranean; he said it was the richest source of inspiration he ever tapped. In 1941, Escher wrote a paper called Regular Division of the Plane with Asymmetric Congruent Polygons. The paper was about his approach to using math in his art work. After he wrote this paper he was considered a research mathematician. He studied color-based division. He also created a system of categorizing shape, color, and symmetrical properties. Escher’s work in mathematics awarded him with Knighthood of the Orange Nassau in 1955. In 1956, Escher came up with a way to represent infinity by using circles on a two dimensional plane. After this he expressed it in a piece of work called Circle Limit 1. He then created Circle Limit 2, 3and 4. These works expressed how he was able to create perfectly consistent mathematical designs. In 1958 he published another paper called Regular Division of a Plane. In this paper he describes systematic build up of mathematical design in his art work. He also worked on a series of pictures that he is most famous for, called Metamorphosis. In these pictures he would draw something that morphed into something else. In 1962 Escher’s work was published in a book called “Escher on Escher”. It included illustrations and information about his ideas and inspirations for his art work . In July 1969 Escher worked on his last piece of art before he died. Many well-known museums feature Escher’s art work. Some of these museums include the National Gallery of Art in Washington D.C., The Fine Arts Museum in San Francisco, and The Escher Museum at the Hague. There are even a large number of private collectors. M.C. Escher is important because he contributed to the world of mathematical art. In his lifetime he created more then 150 pieces of art. All of his artwork was original and very imaginative. He wanted to emphasize shape and depth in his work; he didn’t like flat shapes. Now Escher is the topic of many lectures. He was a brilliant thinker for his time.